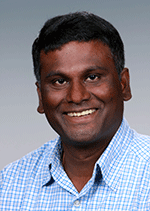 Hydrocarbon Processing scientist Satish Nune recently joined the editorial board for the Journal of Heterocyclics. The Journal of Heterocyclics publishes original research, editorials, and reviews related to heterocyclic chemistry. As a board member, Satish will review manuscripts, contribute research, and take part in the development of the journal. His term began in October 2015, and he can serve on the board indefinitely. Nune's research at PNNL focuses on the development of smart nanomaterials for gas storage, separation, sensing, delivery, and imaging applications. Satish is a member of the American Chemical Society and the Society of Petroleum Engineers, and serves as a peer reviewer for several scientific journals. His work has been highlighted in publications for the National Cancer Institute and the Royal Society of Chemistry, and Science Editors’ Choice.